Adventurers have been carving their way through our mountain wilderness since the late 1800s. Today, we just do it in a little more style. 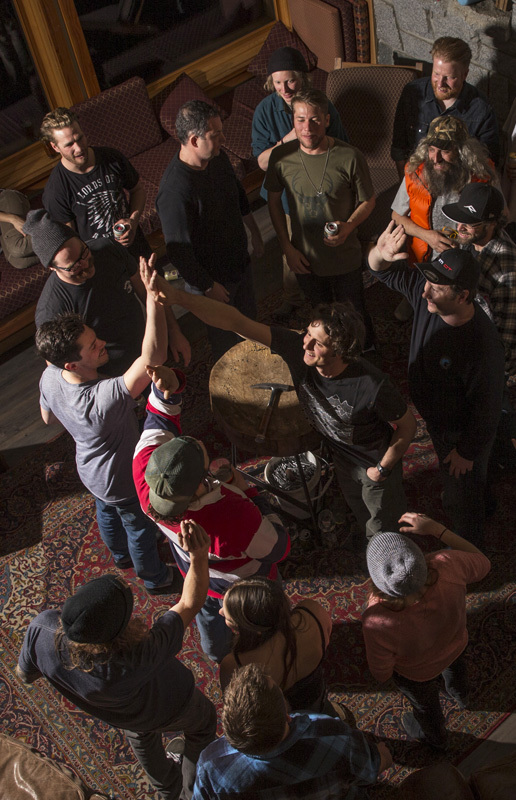 Our 11,000-square-foot lodge sits at the bottom of our massive backcountry playground and comes stock with gourmet food, a lively bar, outdoor hot tub, private rooms, and most of all, great times full of story and cheer. Retallack is located approximately an hour’s drive north of the artsy, bohemian, laid-back town of Nelson, British Columbia. We’re accessible by car on a well-maintained highway, which means you don’t have to worry about baggage limits on helicopter flights, long trips to your accommodation in other vehicles, or leaving your car behind in an unattended parking lot. After all, why waste valuable riding time spending hours getting to and from your accommodation? Our luxury timber frame lodge is nestled in an old growth forest on the banks of the Kaslo River – site of the Academy Award nominated film Snow Falling on Cedars. Retallack Lodge will be your home base during your powder snow or mountain biking adventure. You can expect friendly service in our cozy surroundings as you indulge in gourmet meals, carefully prepared by our chefs and served in style in our fully licensed bar and dining room. Feel free to sit back and relax in front of our fireplaces and watch “caveman television” or find your swagger in our games room. To round things off, rejuvenate yourself in our sauna and hot tub, or experience a variety of our massage therapies. The heart of Retallack Lodge is our spacious living room with its comfortable leather sofas and impressive two-story granite fireplace. We also offer a pleasant 42-person dining room, cozy bar, games room, entertainment room, sauna, outdoor in-ground 12-person hot tub and wireless internet access. Other amenities include an equipment room for tuning and repairing your gear, and a changing room where you can leave your gear and outerwear overnight. You can also let our massage therapists get your body back into top form so you can get the most out of your time on the mountain. Our lodge sleeps up to 24 guests in 11 warm, comfortable guest suites. Bedrooms are furnished with single or double beds, bedecked with goose down duvets, bedside tables with reading lamps, and a hanging space for clothing. Each suite includes a private bathroom with shower. Imagine enjoying a delicious three-course dinner with your choice of wine, right in the middle of one of the world’s most beautiful and unspoiled alpine wildernesses. Here at Retallack, we’re proud to offer our guests mouth-watering cuisine and a thoughtfully-assembled wine selection, all in the cozy surroundings of our backcountry timber-frame lodge. However, we understand that you want more than gourmet food and wine during your holiday – you’ll also need high-energy meals and snacks throughout the day if you’re going to tear it up on the mountain. Like all passionate riders, we know how important it is to stoke your engine at breakfast, refuel at lunch, and top up those energy levels après riding. That’s why Retallack’s culinary philosophy is, “energy-packed meals by day…fine dining by night.” It’s all part of the ultimate backcountry experience. Our office is in Nelson, our lodge is in the Selkirk mountains. Learn more about getting here in the summer and winter.